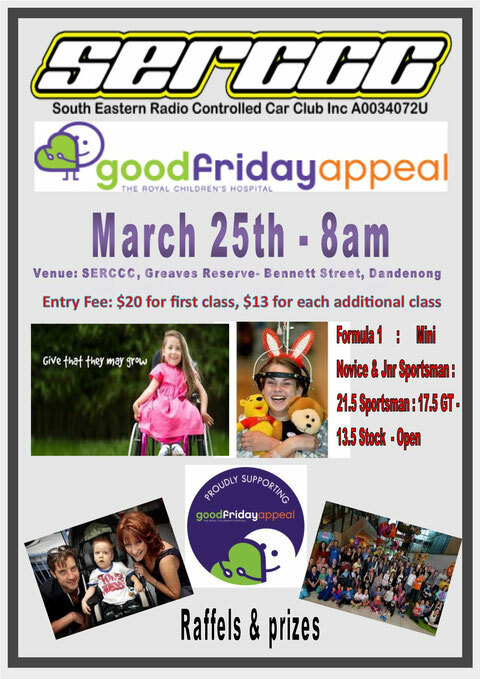 SERCCC will be donation all profits raised on good Friday from race entry, food, drinks, to raffles throughout the day. We ask everyone to donate generously by entering the event and spending a few dollars on raffle tickets and food & drink. We will also appreciate any money donations for this wonderful cause. Tires for all classes will be OPEN. All cars & radios must be taken to the scrutineering area immediately after the race, Competitors failing to do so will forfeit current round. You must marshal the race immediately after taking your car to scrutineering. No repairs are to be carried out by marshals nor are those marshals to return a stopped car to the pit area. Marshals are to remain at their station until the last car racing has crossed the finish line. It will be a driver’s responsibility to ensure that the transponder is securely mounted onto their car. If a transponder falls out of a car, that car will not be manually lap counted. The detection loop will be open before every race to check you have the correct transponder. In the interests of safety the event organizers recommend that your 240V electrical equipment be tested for safety prior to the event (eg; power supplies, soldering irons, power boards). We reserve the right to refuse the use of any equipment considered unsafe. Lipo batteries must be charged in fire proof LiPo charging bags. A club air compressor will be available for use by all entrants, personal air compressors may not be used to reduce potential power spikes. 240 volt power will be available (leads & power-boards will be required). Club compressor will be supplied. Food and beverage facilities will be available. Male & Female toilets available. Details to be released shortly! SERCCC would like to thank everyone that helped and all those who came along to the Good Friday Appeal "Race For Kids" event. We are very proud to announce the final total raised for the Good Friday Appeal was $3083.14 breaking our previous record in 2013 of $2500, Well done to everyone and thank you so much for your support throughout this event. "give that they may grow!" In 2012 and 2013 South Eastern Radio Control Car club raised close to $2500 each year. In 2015 our aim is to do it exactly the same thing! So come along and help our club raise money for the kids in need at the Royal Children's Hospital Good Friday Appeal. For Event information please view the bottom of this page. The strength of the Good Friday Appeal lies with the thousands of people who volunteer their time, expertise and creativity to organise fundraising activities throughout the year. Together they have raised more than $258 million for the benefit of the hospital since the Good Friday Appeal began in 1931. The activities of the Good Friday Appeal lead up to an all-day telethon, broadcast live across Victoria on Good Friday and supported by the Herald Sun, Channel 7 and 3AW 693. The Good Friday Appeal started in 1931 when a group of sportsmen and journalists from The Herald & Weekly Times Pty Ltd (HWT) publication "The Sporting Globe" organised a sporting carnival in aid of charity and nominated the Royal Children's Hospital as a beneficiary. In 1942, the Managing Director of HWT agreed that The Herald and radio station 3DB should promote an annual appeal on Good Friday. In 1957, Channel 7 joined The Good Friday Appeal and began the first day-long telethon. Channel 7 Melbourne and HWT have remained major supporters of The Good Friday Appeal and in recent years 3AW 693 and Magic 1278 became official radio supporters. The Royal Children's Hospital Good Friday Appeal ABN 69 084 797 965, (Registered Fundraiser 12662) is now a public company in its own right and is endorsed by the Australian Taxation Office as a deductible gift recipient. Donations to the Good Friday Appeal are for the benefit of the Hospital and are channelled through the Royal Children's Hospital Foundation.